Jim Harbaugh ditching trademark $8 pleated khakis? Published: Jan. 15, 2014 at 04:56 p.m. Updated: Jan. 15, 2014 at 05:51 p.m.
San Francisco 49ers coach Jim Harbaugh is so committed to his shirt-tucked-in-khakis look that he wore the same ensemble with multiple layers underneath to cope with the frigid temperatures in Green Bay two weeks ago. Dan Hanzus joked on that night's "Around The League Podcast" that Harbaugh's closet resembles a superhero's, comprised purely of dozens of tan khakis and black shirts. Now that his wife has made a public plea to ditch the $8 Walmart pleated khakis, Harbaugh has made a slight adjustment to his wardrobe. He switched to flat-front tan khakis for Wednesday's press conference. "Problem solved there," Harbaugh quipped to reporters. "The Levi's or the Nike and the Dickie makes a flat khaki. So 'happy wife, happy life.' As far as tuckin' the shirt goes, that will be great. I'll feel like an innovator." Harbaugh's new duds cost $23. "They were on sale that day," he added. This is a welcome breather from the mid-week's hard-hitting football analysis. Harbaugh often comes across as an unhinged lunatic due to his animated in-game antics, intense facial expressions and downright bizarre language. The great khaki controversy of 2014 has a humanizing effect on his image. This man earns $5 million per year. He's so grounded in his values -- and wrapped up in football -- that it never occurred to him to have an assistant pick up more fashionable high-end chinos. 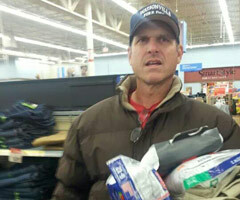 Jim Harbaugh, man of the people.